1 of 4 Lightly coat lollipop molds with nonstick cooking spray. Arrange Red Hots, hearts and flowers in molds. 2 of 4 In heavy saucepan, heat sugar, water and corn syrup over medium heat, stirring, until sugar dissolves, 5 to 7 minutes. 3 of 4 Clip candy thermometer to side of saucepan. Continue to cook over medium-high heat, without stirring, until thermometer reaches 300 degrees F, about 30 to 35 minutes. Remove from heat. Stir in extract. 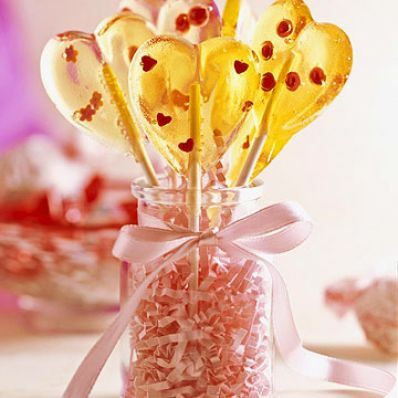 4 of 4 Working quickly and in batches of 12 lollipops at a time, carefully pour hot liquid into molds, dividing equally. Press lollipop sticks into the center of each mold. Let lollipops cool completely. Loosen lollipops from molds and remove. Wrap in cellophane. Store at room temperature up to 1 week. Per Serving: 0 g pro., 0 g fiber, 86 kcal cal., 0 g sat. fat, 0 mg chol., 0 g Fat, total, 11 mg sodium, 22 g carb.